I received my first Hublot automatic last weekend. And up to this instance, I'm still thrilled and wow'ed and excited over my second automatic winding watch! My first automatic, a GMT II half gold is bought in July this year, and i still love and treasure it very much! My second love, this Big Bang 44mm "Red Magic" fusioned with shiny scratch-proof Ceramic, Kevlar (wonder what material it is?) & Rubber is a beautiful piece of art. 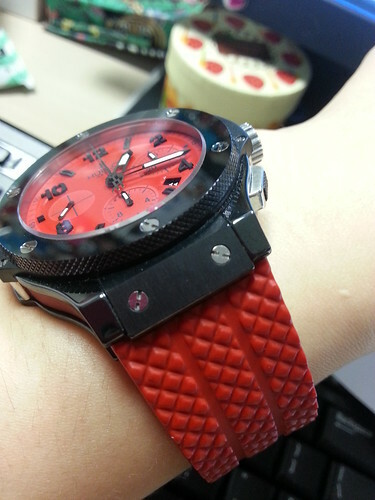 I fell in love with its sporty look at first sight, it has straps that resemble race car tracks, haha.. and of course i bought it because I love its deep red color which looks great on my fair wrist!! It was a privilege and an honour to be the first female Hublot watch owner at the place i work in (pardon me for my vanity statement :) The rest of my colleagues who wear a Hublot are all men. To be honest, I did not read up much on Hublot as a watch maker before my purchase. Fortunately, a friend who bought his Hublot recently, did read up on this brand and he shared alot of its history and its CEO, Mr Biver with me. The sharing was informative and reassuring to me. I felt i have made the right choice. 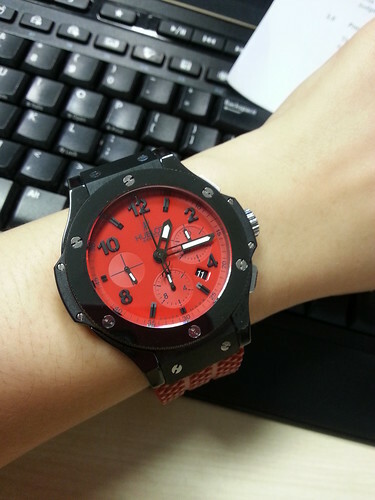 I'm also glad and comforted to know that Hublot takes care of its customers by providing excellent after-sale service. I have yet to experience its service but it feels great to know that i can count on them when my watch requires any attention/servicing in future. Thanks for hearing my first Hublot experience. I hope I could share more with all of you in the near future.